Dozens of Israel Defense Forces soldiers, wounded in this summer’s Gaza War, remain in rehabilitation Sheba/Tel Hashomer Hospital today. With the theme of “The Light will Win!” bringing promise and hope to all, Chabad’s Terror Victims Project (CTVP.ORG) visited these wounded soldiers on the second night of Chanukah. CTVP has been with these soldiers and their families from the time they were wounded and continues to be with them as they go through the difficult and painful process of rehabilitation. We monitor their progress and provide assistance of all kinds – financial, emotional and practical – for both the soldiers and their families, and will do so for as long as they need us. On this Chanukah night, the soldiers, their families, and Chabad’s Terror Victims Project staff and volunteers gathered in the Rehabilitation Department of the hospital. 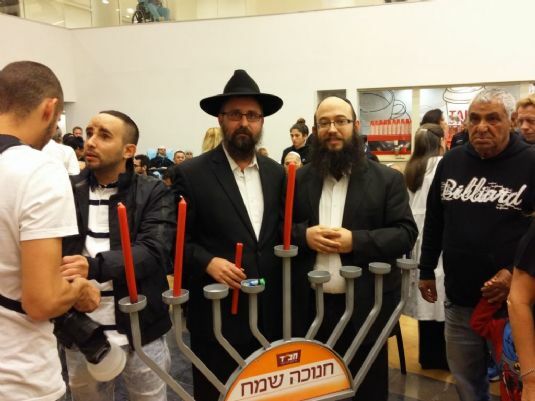 At a moving ceremony, the group, led by Rabbis Menachem Kutner and Yossi Swerdlov of CTVP, kindled the Chanukah candles together symbolizing the miracles and wonders that our ancestors experienced in long-ago days. And symbolizing the miracle of the survival of these courageous soldiers and the hope for full healing for all of them. All of the stories of these soldiers are miracles in their own right. But one story in particular stood out that evening, as a miracle took place in the view of everyone present. Ohad was critically injured during the war. CTVP had gone to his bedside right after his admission to Soroka Hospital, learning from his family of the severity of his condition. Ohad lay unconscious from a traumatic head injury. 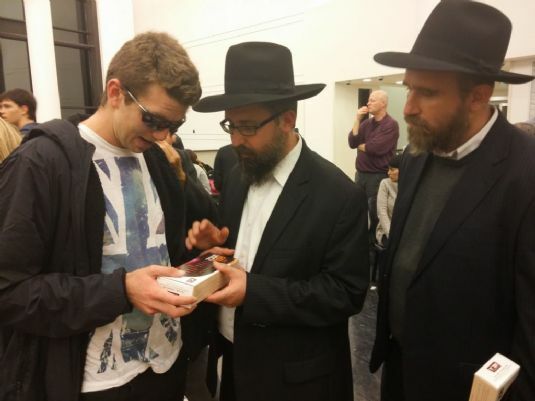 Since we first met Ohad and his family last summer, he has miraculously regained consciousness. He was transferred to Tel Hashomer for rehabilitation. With great effort, he is learning the alphabet and slowly learning to speak again. His first words were Mom and Dad, but so far that was all he was able to say. 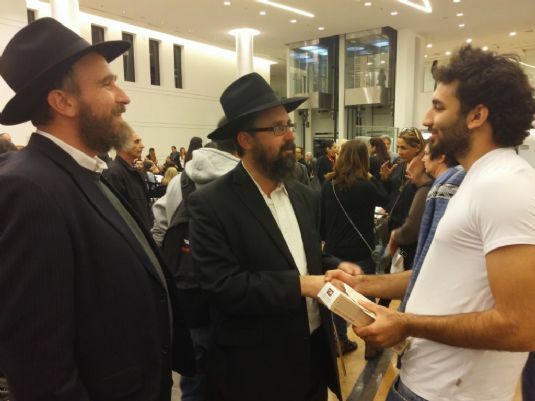 Ohad was invited to light the menorah with Rabbi Kutner. 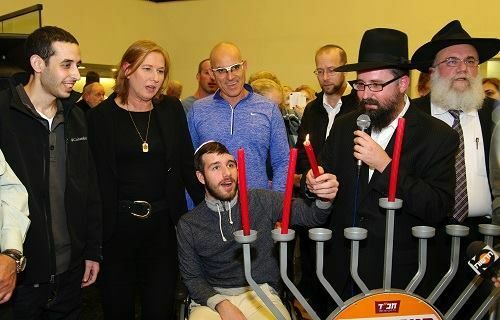 Rabbi Kutner said the blessings and Ohad held the candle with his left hand which was functional (he is pictured in the wheelchair). 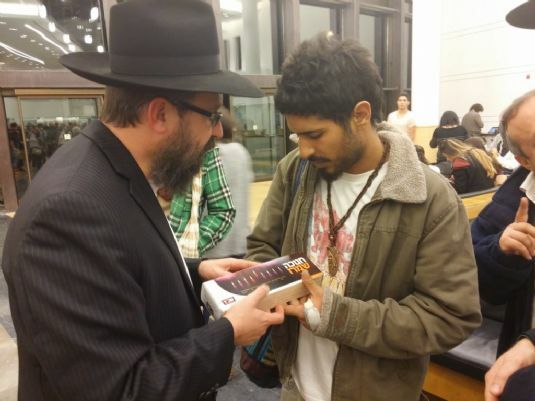 Then, suddenly, the room went quiet as Ohad slowly began to mouth the words to “Haneirot Halalu” and “Maoz Tzur” along with Rabbi Kutner. The familiar tunes that he had learned during his childhood created a miracle before the eyes of everyone. His parents ran up to him and showered him with hugs and kisses mixed with tears of joy. There was not a dry eye in the room as everyone acknowledged this great miracle and expressed thanksgiving to G-d. Everyone is asked to please continue to pray for the ongoing recovery of Ohad ben Erica and all the brave IDF soldiers who have sacrificed so much to protect our precious homeland of Israel for all of us. 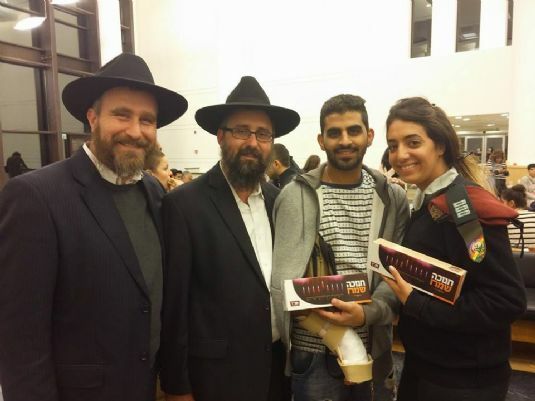 During the party, CTVP Rabbi Yossi Swerdlov and his son Avremah, together with the Chabad Shaliach to Sheba/Tel Hashomer Hospital, Rabbi Levi Gopin, gave each wounded soldier and all the patients in the Rehabilitation Department, a personal gift pack that included a Chanukah menorah. Rabbi Hagai Levi, a Chabad Shaliach to the Diamond District nearby, also participated in the ceremony, and gave his blessings to the wounded. It was an extraordinary evening that will be remembered for years to come by everyone there as the Chanukah that produced its own miracle in our time.